This is setup options for MS Classic dialog (edtMSClassic). They are located at Dialogs tab. 1. "Ask user for send consent" (.edoShowSendErrorReportOption) option will ask user for their consent before sending bug report to developer - by showing "Please tell us about the problem" and presenting "Send Error Report" and "Don't send" buttons. 2. Default choice is selected by enabling/disabling "Default choice: send report" (.edoSendErrorReportChecked) option. If this option is checked - the default choice is to send the report. If this option is unchecked - then the default choice is NOT to send the report. Default choice affects which button (option) will be highlighted/selected when dialog is shown. 6. "Mandatory e-mail" (.edoMandatoryEMail) option will not allow user to close dialog without entering a proper e-mail. This option have no effect if e-mail input control is not visible. Use this option to force user to specify e-mail. This options is useful if you perform delayed/queued report sending manually. For example, you store your bug report in folder, then some application pick up/send/process this folder - and you want bug reports to have end user e-mail for contacting it. 7. "Only when sending" (.edoMandatoryEMailOnlyWhenSending) option modifies mandatory e-mail option. When this option is disabled - e-mail will always be required. When this option is enabled - e-mail will be optional if user closes dialog without sending report. Use this option if you want user e-mail specified, and you perform sending immediately (via EurekaLog). 8. "Show a custom 'Help' button" (.edoShowCustomButton) option shows a "Help" button in the left-bottom corner of the dialog. You can assign your code on this button via the OnCustomButtonClick event. 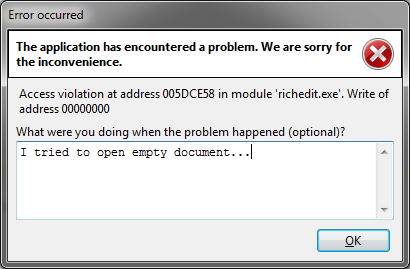 • "The application has encountered a problem" in the header. • "Restart application" - a checkbox to restart application. • "Terminate application" - a checkbox to terminate application. 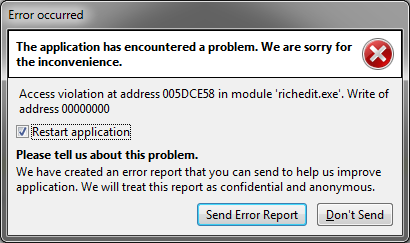 • "We have created an error report that you can send to help us improve application" - a description for send consent's asking. The "Checked" option controls if this checkbox is initially checked or unchecked. If "Checked" option is checked, then when MS Classic dialog appears with restart/terminate checkbox visible - this checkbox will be checked. And the opposite: if the "Checked" option is not checked, then restart/terminate checkbox will be unchecked, when dialog appears. Of course, this option have no effect, if checkbox is not visible (for example, if you select "Do nothing" option). A "after N errors" part is controls, when to show restart/terminate checkbox. Again, this part is ignored, if you select "Do nothing" option. Value of 0 means that restart/terminate checkbox will be visible always. 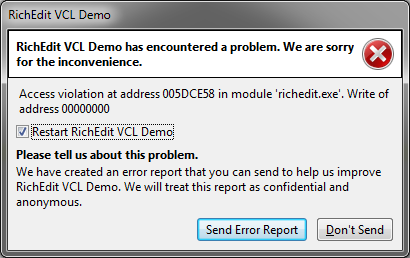 Value of 1 means that checkbox will be displayed only in second error dialog. 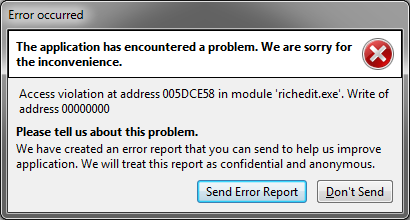 Value of 2 means that you got two error dialog without checkbox and 3rd dialog will have it. And so on. At run-time: when user checks restart/terminate checkbox, then your application will be restarted or terminated after closing error dialog and saving and sending bug report (if enabled). If user unchecks the checkbox - then your application will continue to run. 16. "Close every exception dialog after M seconds" (.AutoCloseDialogSecs) option allows you to automatically close exception dialogs after timeout of inactivity. Value of 0 means disabling of such feature - i.e. each dialog may be closed only manually by user (via clicking on dialog's buttons). Any other value (> 0) means that dialog will be closed after that amount of seconds, passed since its popup. For example, if you specify 180 seconds - then dialog will be closed exactly after 3 minutes, if user didn't closed it before.